Kristie Finnan is available for speaking engagements at Schools, Childcare Centers, Girl Scouts, Mommy Groups and Corporate Working Mother Events. 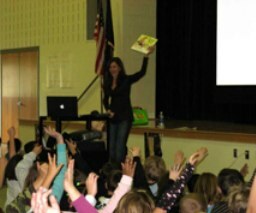 If you would like to book an Author Event, please e-mail the details to author@mommyshoes.com. We look forward to meeting you. 2009 Time slots are filling up quickly! Book now for your 2009/2010 school year. Pre-teen/Teen Workshop: I can be/do anything if I just put my mind to it! Mommy-"Feel Good" about Going Back to Work! Let's feel good about working! Let's All Celebrate Being Mommy and the difference we make in the world! Being a mom is amazing, rewarding and fun. It can also be challenging at times, especially when you have a career to balance on top of everything else. It's also really difficult for our kids to understand why we may have to miss a picnic or soccer game, travel overnight or be at the office late some nights. We hope you enjoy the book and hope it helps you talk to your children about all of the jobs you have to do as a mommy as well as your career. We also hope to recommend resources, tips, websites and products to make your life easier. See to the right for some helpful links for the working mother and stay home moms to help balance, juggle and manage your busy life! Real Moms Review Really Cool Stuff!